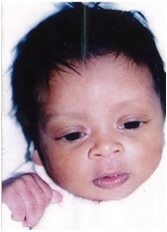 Female born in 2003 adopted via Kidane Mehret and Koala House through Australians Aiding Children Adoption Agency to Australia in 2004. She was relinquished by the employers of her biological mother; mother was a house maid who was missing after the birth. The child was given to the Woreda 3, Kebele 53 police by her mother’s employers. She arrived at Koala centre approx 24 – 48 hrs from birth.